I love barbecued food. Eating al fresco, even drinking al fresco, has got to be one of my favourite things. In my early 20’s I was living in Vancouver. My first flat was on the 8th floor with a balcony overlooking the harbour. The flat itself was tiny, where the balcony was almost the same size as the flat. I was fortunate enough to have on it a little barbecue, as a gift from my parents. Because it was gas (don’t judge me!) it was easy to light and therefore got a lot of use. I mean a LOT of use! If you factor in not having to do any washing up (except your plate of course) then you might appreciate why I used it so much. I could easily prepare a meal on it every day. Even in the winter time, I would move the barbecue up to my sliding door, open the door to light it, close the lid and close the sliding door whilst I waited for it to warm up. Later, I would slide the door open again to place the food inside. All whilst I stayed nice and toasty indoors! 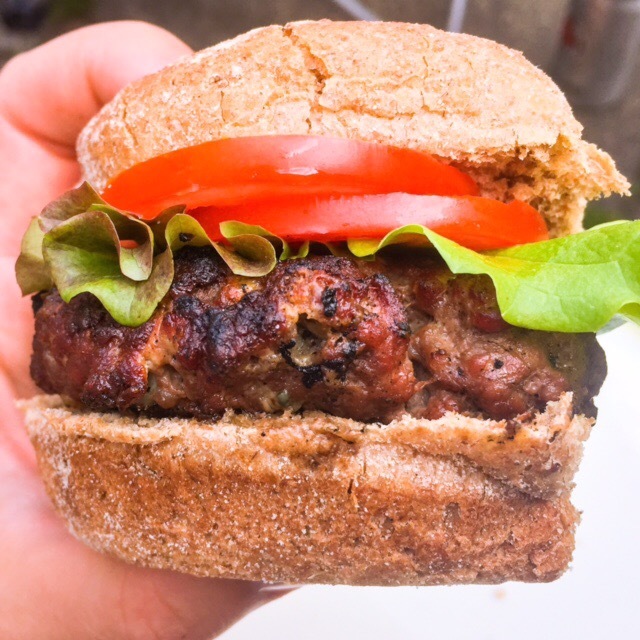 One of my favourite burger recipes to make was this one. So much so, I have continued to make it after all these years. There is no messy sauces to contend with and it tastes great on its own, or topped with fresh lettuce and tomato in a nice roll. In a bowl, break down the minced beef and crumble in the blue cheese. Add in the horseradish and salt and pepper. Mix through so the cheese is evenly spread throughout the mince. Divide the mix into four and form round patties. Grill on the barbecue until cooked through.